Aged 79 Years. Passed away peacefully on 27th March 2019 after a long illness. Now at rest. 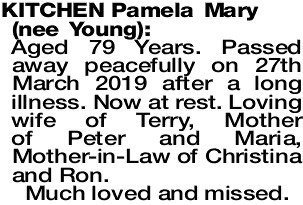 Loving wife of Terry, Mother of Peter and Maria, Mother-in-Law of Christina and Ron.